This will be a “quick and dirty” case presentation. But, I’ll update it as the case progresses. Patient is a 53 y.o. woman from China, who speaks a little English. Her boyfriend is a long-time patient in my practice. 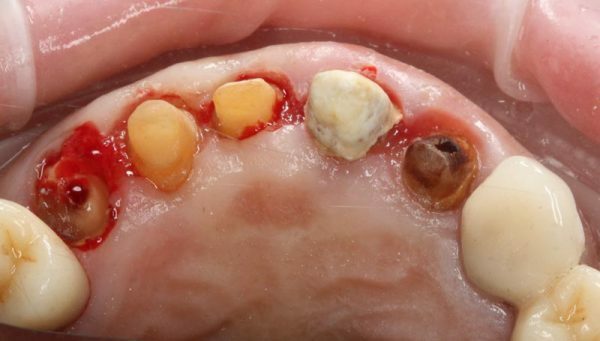 She first presented with a toothache… actually multiple toothaches. #’s 6 – 10 are splinted. 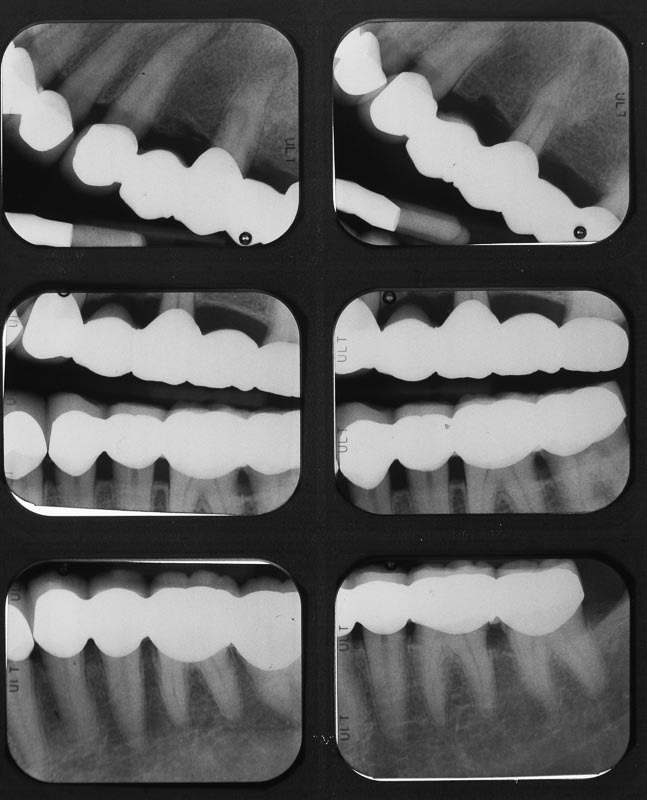 #6 is blown out with recurrent caries. I made pre-op models and a Siltech matrix to help make the provisionals. Ultimately, the entire case needs to be re-done. But, the upper anterior segment was the most dire, so we started there. She will see an endodontist for the RCTs in the posteriors. 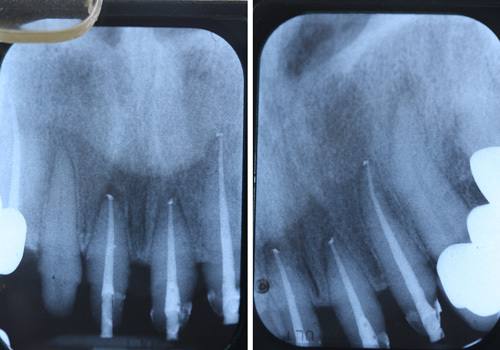 The first order of business was to remove the splinted crowns #’s 6- 10. They are porcelain fused to zirconia. So, you KNOW how much FUN that’s going to be. And, so it was…. not so much fun. I went through 6 diamond burs. The restorability of #6 is questionable. But, I hate to extract a canine. I went ahead and did the endo on it. I’ll build it up and prep it at the next visit and see what I think. Given that I believe there is a biologic width violation on #’s 8 and 9, I might send her for crown-lengthening and keep #6. 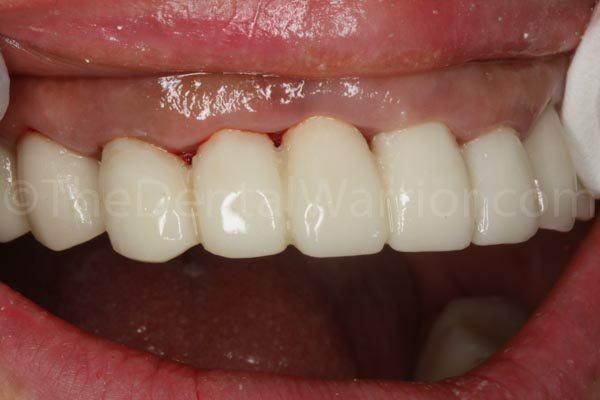 Occlusal view of #6 – 8, after removing crowns and some of the cement. 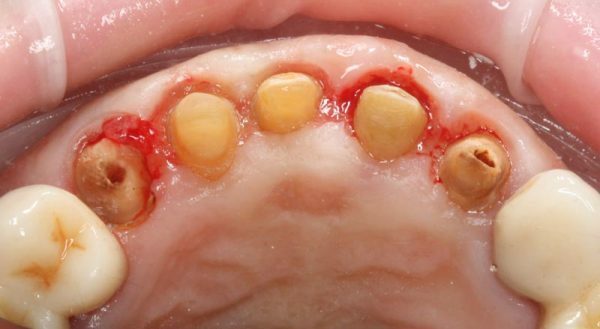 Note the hyperplastic gingiva over #6. 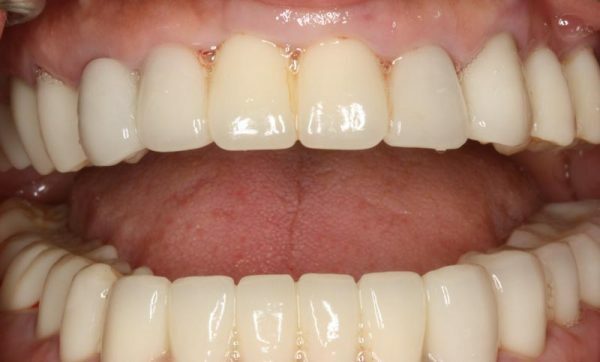 Occlusal view of 9-10 after removing crowns. The crowns after sectioning and removal. Note the lovely “schmutz” on the inside of some of them. Getting things cleaned up. The hole in #9 was also already there. All of the “endo accesses” you see here were pre-existing. No instrumentation of the canals nor any canal filling (see x-rays above). 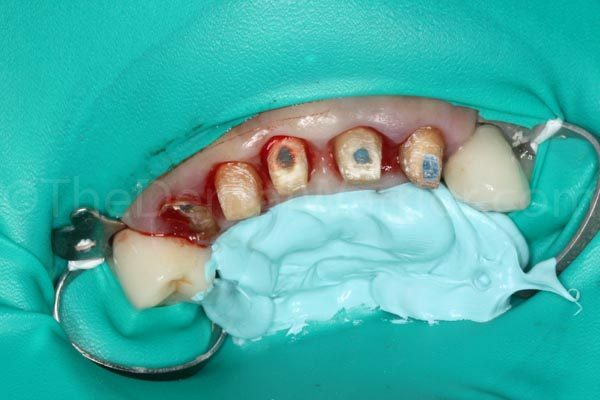 I went through six diamond burs getting the five crowns off. Provisionals. It will be interesting to see how the tissue has responded at her next visit. I worked on her from 9am to about 12:30pm. Next, I’ll do the RCTs on #’s 8, 9, and 10. I’ll also do a post and core and re-prep #6. We got the patient back to do the RCTs and build up #6. 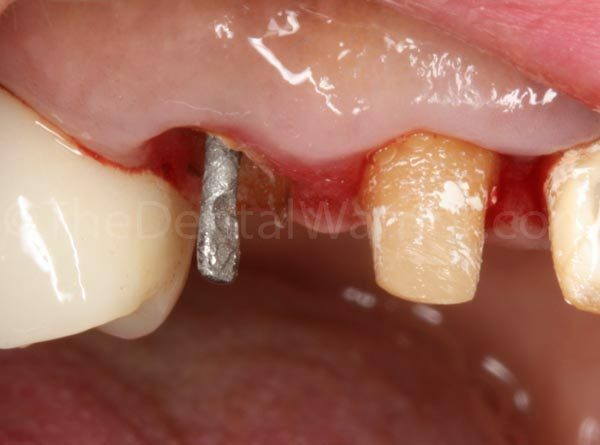 I think most of you will agree there is a perio issue. #6 will need crown lengthening surgery to provide some ferrule for the crown. 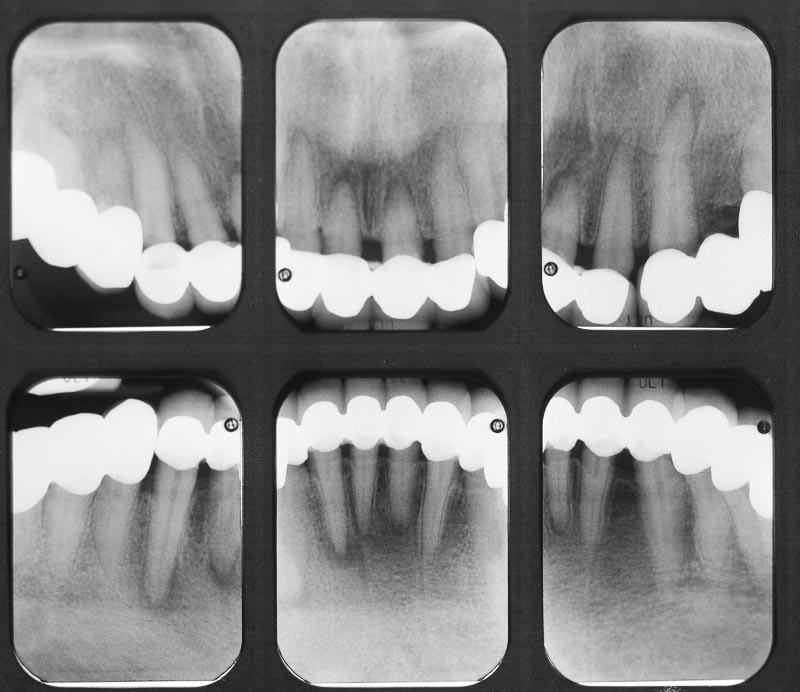 I also believe there is a Biologic Width violation with the rest of the teeth secondary to the original crown preparations. Endo time! Split dam isolation makes it easy. 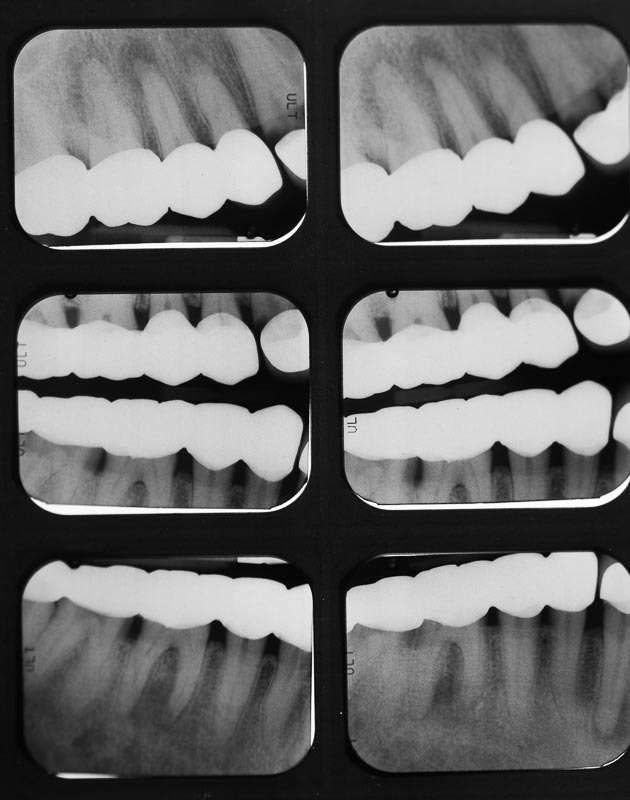 At the last visit, I used some blue block-out composite (used for bleach trays) to temporarily seal the previous “accesses.” Remember… these facial accesses were already there when I removed the crowns. This is what came out of the canals. 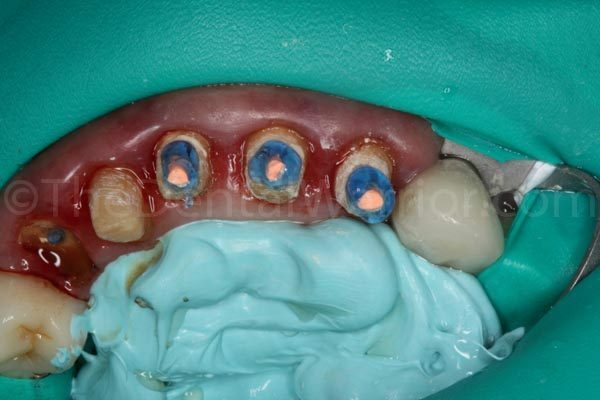 I used some blue flowable composite to briefly “seal” around the gutta percha points, so I could remove the rubber dam for the final fill x-rays. Another view of the post in #6 and the other preps (not final preps). I used a core former to give me a starting point for the build-up. Preliminary prep of #6 and others. 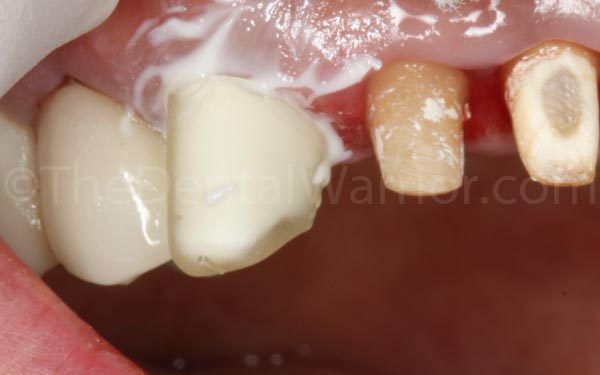 Occlusal view of preliminary preps. Off to perio next! This entry was posted in Case Presentation, What Happened Today and tagged case presentation, Chinese crowns, zirconia crowns. Bookmark the permalink. That poor patient! Bet she is thankful to have found you… I hope she understands how fortunate she is to be in your care. Her old crowns fit like boots on a rooster. Mike, I’d like you to comment a little on presenting cases such as this. One thing I’ve learned over the years is to never judge anyone’s pocketbook. 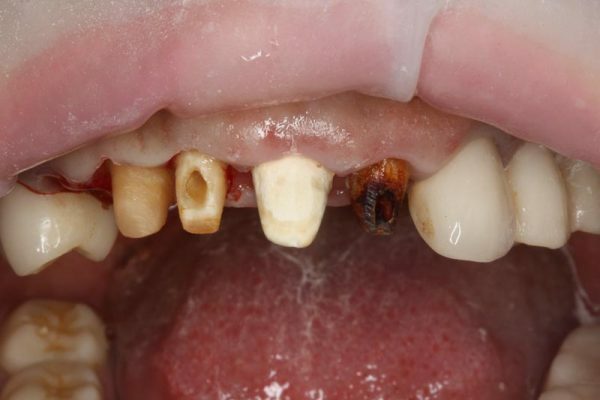 That being said this kind of dentistry is not always for everyone and can be expensive even when you phase it. 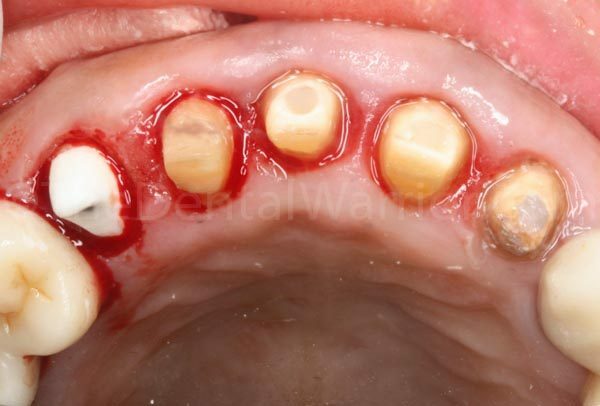 I realize in this instance it was a referral from a current patient so they might have already known going in that it was probably an extensive and expensive case and unlike many with such issues she was “aware” of problems (toothaches), so my question might not totally apply in this instance. 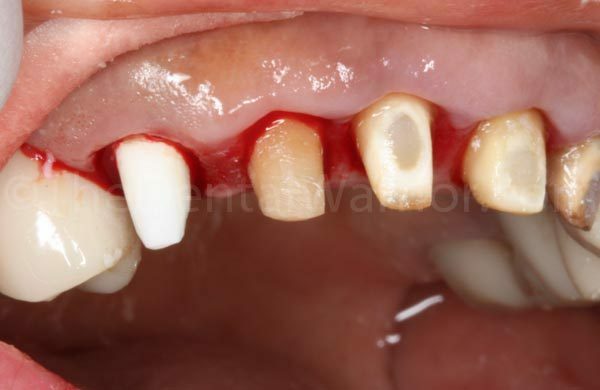 But generally speaking when you see a case like this what is your initial approach to making the patient aware that their case is going to likely be extensive, which generally translates to expensive especially in cases where the patient may not be as aware of problems as this person might have been? I guess I am asking how do broach the subject of “Mrs. Jones you have an extensive case here” and at what point do you do so? Hi Ken. It’s a good question, even though I’m not sure how to answer it. I could start by saying it depends on each patient. It depends on our rapport. Is she aware of the problems? Or oblivious? What has she said to me that may give me a hint on her goals and resources? What kind of car did she drive up in? 😉 Ha! Just kidding. I give them their options, ranging from no treatment to ideal. Goes to show you how something can look GREAT on the surface, but be very bad underneath! Looks like she is in good hands now. Please post follow-up. Thanks. Unbelievable case Mike! 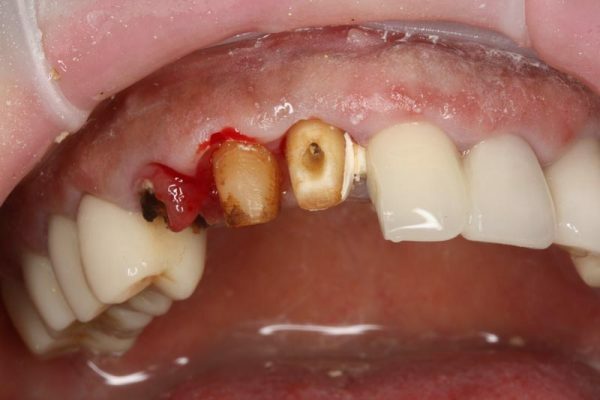 I can’t comprehend how a dentist could overlook 7+ apical lesions… a dental preschooler could see a problem. 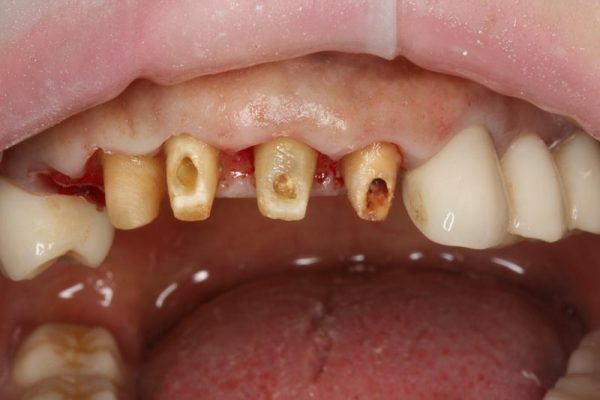 I don’t believe the lesions were overlooked, as I don’t believe they were there when the teeth were prepped. 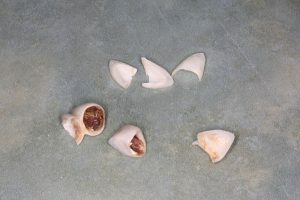 The lesions were CAUSED by the treatment in China. I think the preps exposed the pulps. Then they did the “pulpotomies.” Then they cemented the crowns. 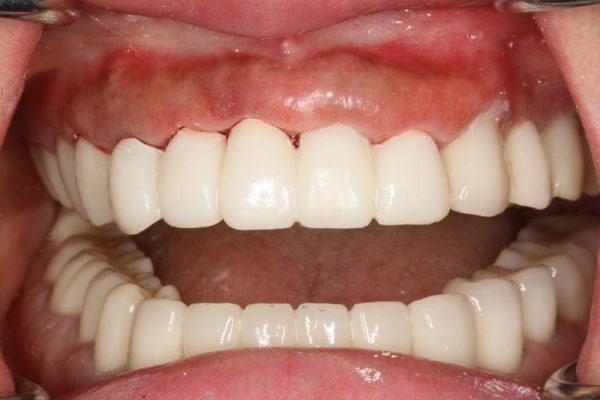 The lesions developed as a result. 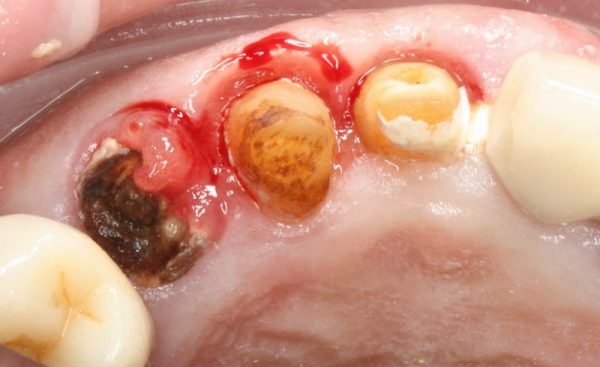 This is the first time i too came across your blog .And man..i pity the patient who is going to undergo a full mouth rehab once again at no fault of hers! your case,case presentation and definitely your comment section is all worth a read,otherwise,i never leave comments!but here,i was compelled to!! I feel very sorry about that woman and it’s a great pleasure that she has you at that time like a life savior.